HELP! I believe God has a calling on my life . . . and I don’t know what to do. Have you been there? Are you there now? What on earth does this mean? Does this mean I am going to be one of those preachers? Does this mean I am going to Timbuktu for Jesus? Can somebody please help me? I encounter this so often. Not with these words exactly, but definitely this sentiment. Being called of God into some level of ministry can be quite a frightening and/or confusing thing to experience. What do I do now? Let me clarify something up front. GOD HAS CREATED EACH AND EVERY PERSON ON PURPOSE AND WITH PURPOSE. No person is here by accident or mistake. Regardless of whether or not your earthly mom and dad planned for your existence….God planned you. He and only He is the author of life. And as the author of your life He knows how the story is designed to be written. There is peace, joy, and supernatural assurance that accompanies a person who steps into and walks in God’s destiny for his/her life. Romans 12 Therefore I urge you, brethren, by the mercies of God, to present your bodies a living and holy sacrifice, acceptable to God, which is your spiritual service of worship. 2 And do not be conformed to this world, but be transformed by the renewing of your mind, so that you may prove what the will of God is, that which is good and acceptable and perfect. In light of these two simple yet profound verses of Scripture let us draw on some principles to God’s will for your life. 1. Present yourself entirely to God. If you are in the Armed Forces and you are uncommitted to the service, you will be discharged. If you are a student and are uncommitted to your studies, you will flunk out. Married person, if you are uncommitted to your mate, you are headed for a divorce. If you’re a stockbroker who is uncommitted to your client, you will go broke. If you are a doctor and are uncommitted to your patients, they’ll look for a physician who cares. If you are a lawyer and are uncommitted to the law, you will be disbarred. If you are a football player and are uncommitted to the team, you will be cut. If you are a waiter and you’re uncommitted to your table, you will be tipless. If you are a Christian and are uncommitted to Christ, you are heading for serious judgment. (Steve Hill, “The God Mockers” page 85). God is looking for commitment. One of the challenges for me early on in coming to terms with God’s calling on my life was to be gung ho one day and humdrum the next. That was dishonoring to God and even to me. Lack of commitment to God when you are sensing His calling is in essence telling Him you don’t feel He can completely do what He has called you to do with Him. I want us to understand a principle about what God does with that which is presented to Him. Do you remember the story of the feeding of the 5,000 with the 5 loaves and bread and 2 fish? Look at the story has told by Matthew. Matthew 14:15 When it was evening, the disciples came to Him and said, “This place is desolate and the hour is already late; so send the crowds away, that they may go into the villages and buy food for themselves.” 16 But Jesus said to them, “They do not need to go away; you give them something to eat!” 17 They said to Him, “We have here only five loaves and two fish.” 18 And He said, “Bring them here to Me.” 19 Ordering the people to sit down on the grass, He took the five loaves and the two fish, and looking up toward heaven, He blessed the food, and breaking the loaves He gave them to the disciples, and the disciples gave them to the crowds, 20 and they all ate and were satisfied. They picked up what was left over of the broken pieces, twelve full baskets. 21 There were about five thousand men who ate, besides women and children. Here are the key principles. Jesus was 100% confident that the disciples could provide food for the people. He said “you give them something to eat.” The miracle of the feeding didn’t originate with Jesus, it originated with the called disciples. Jesus wanted them and us to understand that we do not have to wait until we think we have it figured out, we simply have to present to Him what we have. The challenge wasn’t whether Jesus could multiply the food, but rather could the disciples present to Him what they had even if they saw it as inadequate. Secondly, Jesus tells the disciples to “bring them here to ME.” Now the story gets exciting. Now Jesus Himself is getting involved. Do you know what that means? That means the supernatural is colliding with the natural and Heaven on earth is about to become a reality. When the disciples committed to present to Jesus what they had, He committed to get involved. Notice that He did not see what they had, shake His head, and say, “Good luck with that.” Absolutely not. He was moved by their willingness to bring what they had. When you and I bring what we have to Jesus – regardless of how insignificant we may see it as being – He gets involved and turns a natural disaster into a supernatural situation. That is good news. Next, Jesus is specific in how He deals with what we present to Him. He takes it. He didn’t brush it off. He didn’t send the disciples to the local McDonalds. He took the food. He took what was offered. This tells me that despite what you or I may think or what we may have heard – what we bring to Jesus is good enough for Him to take and use for making a difference. Romans 12 says that when we present ourselves to Him, we are acceptable. God accepts you. So many times, however, we desperately want the acceptance of man or others around us and miss the key component of being accepted by God. This happens as we offer ourselves to Him! And the kicker is that when you are accepted by God, He has a way of making you accepted and acceptable to others. When Jesus accepted the loaves and the fish, He made them acceptable to the masses. What a powerful principle! The exciting part is that He didn’t just “TAKE” the food, but rather He went a bit further with it in that He BLESSED what was offered. Guess what? GOD CANNOT BLESS WHAT WE DO NOT GIVE HIM. But, when we give him what we have, when we present ourselves to Him; He adds Himself to it, His blessing and it becomes more than enough. I really like that. Then, Jesus broke the bread. This is a key principle to understand. God is not looking to break you down and destroy you. What He is doing is removing the excess and the flesh baggage. The one who endures the humbling and breaking of God is the one who becomes nourishment for the masses. Imagine if one of the 5 loaves had become rigid and told Jesus, “Thou shalt not break me!” That loaf would have been useless. It would have dried up and become moldy and essentially self-consumed. Finally, note that Jesus gave the food to the disciples to be given to the masses. There is a continuation of the connection, commitment, and teamwork between us and Christ. Some wrongfully assume that if they offer themselves to Christ, He is going to remove them from the picture and do everything Himself. That is simply not true. I heard Robert Gladstone (a professor I had at BRSM) say one time, “When Jesus comes into a person’s life, He enhances them as He makes room for Himself.” When Jesus gave the food back to the disciples that they had presented to Him it was at that point of greater value and usefulness. Those things that we keep in our hands and do not give unto the Lord will only retain and maintain natural value. Yet when placed in the hands of Christ, the supernatural value becomes meat for the Master’s use and food for the hungry and needy. In our own strength, there is only so much we can do. But with God all things become possible. If you are called, if you want to step into God’s destiny for your life, you must first and foremost present yourself to Him completely. As God by sending His son has held nothing back from us, let us in like manner never hold anything back from Him. 2. Live a life of worship. As Paul says to present your bodies a living and holy sacrifice, acceptable to God, which is your spiritual service of worship. It is worship to present ourselves and what we have to God. The idea of worship is often misrepresented and misunderstood. Worship is not the allotted time at the beginning of the church service that includes a set of songs. Worship is not the bulletin that outlines the order of service. Worship is a lifestyle that involves us presenting ourselves to God, realizing we are acceptable to Him, and doing so day after day. Living a life of worship means we don’t only do so when it is easy or feels good. It means we don’t as I mentioned early go gung ho one day and be humdrum the next. It means we love God with all our hearts day after day and offer ourselves to Him completely. I remember once when we did a youth skit at church that seems to accurately depict this idea. It involved people approaching the altar and giving God various things. Someone was portraying a rich person who had lots to give. Someone was portraying a person who was doing some but too busy to do much. And there was a final person who seemed so insignificant and unimportant. The others seemed to cringe at the mere sight of this person. He was broken, tattered, and torn and when he approached the altar he simply laid himself down as the offering. It was a complete spiritual act of worship. My favorite example of a life of worship through presenting to God what we have is found in Genesis 22 when Abraham was being obedient to God in offering Isaac as a sacrifice. Abraham called his act of sacrificing his son “worship.” He was willing to give anything and everything unto the Lord and he called it worship. This use of the word, more than any other, accurately portrays what worship is really about. As used here, the word “worship” literally means to bow or prostrate oneself. It is a recognizing of, responding to, and respecting of the authority of God. 3. Do not be conformed to this world – let the change be evident. If you are going to fulfill God’s calling on your life, you must no longer follow the ways of the world that defined your past. I remember early on in youth ministry I was confronted with this by one of the students in the youth group. 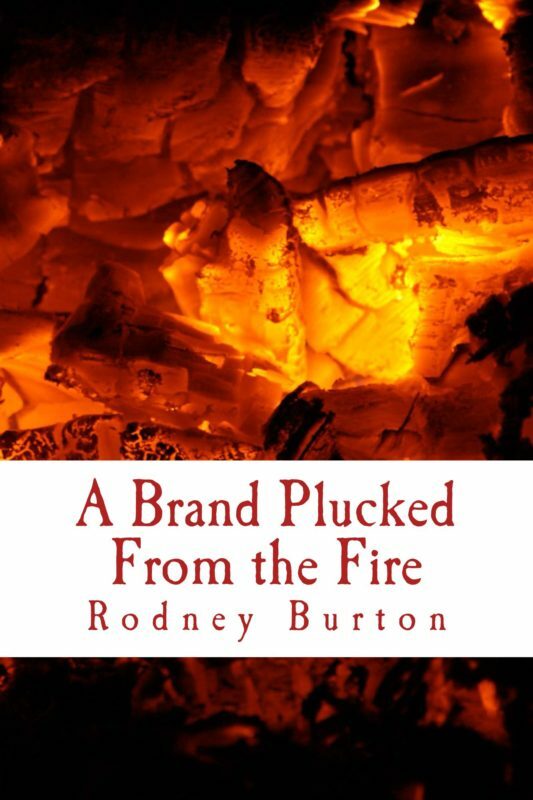 I was in the midst of a teaching with the teens when he asked me, “Rodney, why do you seem to talk highly of and miss your sinner days?” Then and there it hit me. I was holding on to my past just in case the “new life” did not work. I was still conformed to the patterns of the world. And I realized then and there that needed to change and change quickly. The truth is that we cannot have it both ways. Jesus said that no man can serve two masters. James says a double minded man is unstable in all his ways. You can see how this still ties in with principle one of committing ourselves to God. We do so by a turning from the things of this world. Hebrews 12:1-2 tells us to “fix our eyes upon Jesus,” and this literally means to quit looking at whatever has your eye and attention and place your focus on Jesus Christ and Him alone. I continue to be reminded that Peter only began to sink in the water upon which he was walking when he took his eyes of Jesus and saw the wind and the waves. A person will look like and represent whoever it is that they are looking upon and to whom they are being conformed. If you have been called to represent Christ then YOU MUST spend time with Him, fix your eyes upon Him and become like Him in order to properly represent Him. 2 Corinthians 6:14 Do not be bound together with unbelievers; for what partnership have righteousness and lawlessness, or what fellowship has light with darkness? 15 Or what harmony has Christ with Belial, or what has a believer in common with an unbeliever? 16 Or what agreement has the temple of God with idols? For we are the temple of the living God; just as God said, “I WILL DWELL IN THEM AND WALK AMONG THEM; AND I WILL BE THEIR GOD, AND THEY SHALL BE MY PEOPLE. 17 “Therefore, COME OUT FROM THEIR MIDST AND BE SEPARATE,” says the Lord. “AND DO NOT TOUCH WHAT IS UNCLEAN; and I will welcome you. 18 “And I will be a father to you, and you shall be sons and daughters to Me,” says the Lord Almighty. A separating of ourselves from the things of this world is at the same time a joining of ourselves unto God – a coming into the father – son/daughter relationship. Those God has called to serve and represent Him must unite themselves with Him in all ways and make a complete turn away from the old self and the old ways of life. 4. Be transformed by the renewing of your mind. So much of the ongoing battle that we face in coming to grips or terms with God’s calling upon our lives is in our minds. Typically, mental battles are the most difficult and our minds often prove to be the biggest battlefield of all. It is not insignificant that within the context of understanding God’s will for your life there is mention of the need to have our mind renewed. Two examples quickly come to mind. In Mark 5, as Jesus gets off the boat and is met by the man possessed by the legion of demons, the Bible points out something valuable concerning this man’s healing and deliverance. When the people of the town came out to see for themselves what had happened to this man that had them in fear before, we find that they came to Jesus and observed the man who had been demon-possessed sitting down, clothed and in his right mind, the very man who had had the “legion”; and they became frightened (Mark 5:15). The life-consuming battle this man was fighting on a daily basis was going on primarily in his mind. He was literally out of his mind. No person in his right mind would behave in the manner in which this man had become accustomed to behaving. But when Jesus set him free his mind was renewed. At that point Jesus called him to go and tell what had happened to him – to go as an evangelist to his own people. This is overwhelming proof that there is hope for everyone and that the power of God to renew our minds makes all of us usable and fit for His plan. While in our minds we may be trapped by whom and where we have been, God defines us by what He sees and where He sees us going in and with Him. I meet people all the time who are trapped within their own stinking thinking and it keeps them trapped and unable to step into or walk in God’s plan for their lives. We are constantly bombarded with unrealistic natural expectations and dreams of this world and the overwhelming feeling for many is that they are not now nor will they ever be good enough or able to measure up. In their own minds, they are worthless, hopeless, and useless. Yet nothing could be further from the truth. When our minds are renewed in Him – when we come to our senses – God can do anything in and through our lives. The Prodigal Son’s life changed when his mind was renewed. He was restored to his place as a son. He was blessed by his father. Without a renewed mind we will lack effectiveness for God. This is the primary key and way of no longer being conformed to the ways and patterns of this world. Our minds must be renewed. 5. Let your life be proof of God’s will at work.
. . . so that you may prove what the will of God is, that which is good and acceptable and perfect. 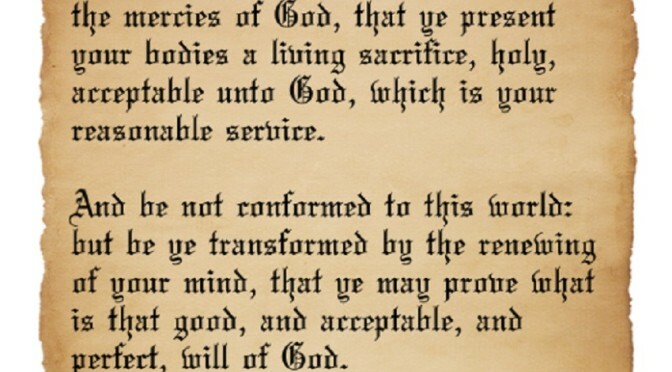 By committing to and presenting yourself to the Lord; by living a life of worship; by no longer being conformed to this world; and, by having your mind transformed we put ourselves in the position to prove God’s will in and through our lives. And Paul points out three important aspects of God’s will. God’s will is GOOD. God isn’t looking to destroy, manipulate, or disregard you. He has our best interest in mind. God’s will is good in that He will not set us up to fail. God’s will is ACCEPTABLE. God is not going to call a person to something that He hasn’t already created them for. When you step into God’s plan and will for your life it is going to be a match for your DNA….every time. God’s will is PERFECT. God has never done anything poorly or incomplete and He is not going to start with the plan He has for you. It is perfect. It will be a perfect fit for you and will perfectly meet the needs of those to whom you minister. Also, notice that the Bible does not say God’s will is good, acceptable, or perfect. It isn’t one or the other, but it is all three. A person will either be in God’s will or they will not. There has been much talk throughout church history about God’s permissive will. In reality that is simply what we have labeled us choosing to do what we want and viewing God’s permission to our free will as His will. That is simply not the case. God’s will is not as spooky or difficult as we often make it. Most of what we are in pursuit of concerning God’s will is the 5-10% of His specific plan for us as individuals. What happens is that we focus our attention on that small part and in doing so we miss the 90-95% of His general will for everyone. His general will is that we commit to Him. His general will is that we live of life of worship and devotion to Him. This involves and includes reading His Word, praying, being faithful in church, and giving of our time, our talent and our treasure. His general will is that we look more like Him than we do like the world. His general will is that we have our minds renewed by His presence, His power, and His Word. Then, we can know and prove the specifics of His will for our lives. Zechariah had a vision of Joshua the high priest standing before the Lord with Satan standing there to accuse him. This book walks through that vision and seeks application of the work of God in one's life to bring them to His desired place of destiny.